Montgomery County businessman Jeff Bartos has entered the field of Republicans hoping to unseat Pennsylvania U.S. Sen. Bob Casey in 2018, launching a campaign video Monday. In his "Hometown" video, Bartos decries the struggles of his hometown while "Bob Casey's Washington is booming," and the video switches to two images of cranes and another of cars driving down a busy urban street. ...there’s a jarring, sweeping image of girders going up in a city much larger than Washington. On Getty Images, it’s labeled “aerial view of construction, shoot by drone,” and supplemental information makes clear that the picture is from the city of Hangzhou, with more than 11 times the population of Washington — and with no height limit. Bartos, who grew up in Reading, is positioning himself as an outsider in his bid to challenge Casey, almost half a year after Donald Trump took the presidency — and Pennsylvania — on a wave of anti-Washington sentiment. 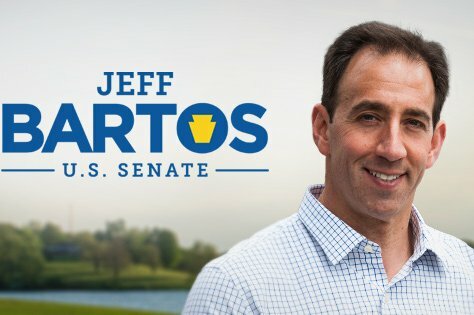 "I’m Jeff Bartos — I’m running for Senate to end destructive trade deals, secure our borders and restore the American Dream," his campaign website reads. "I’ve spent 20 years building businesses and giving back to my community, while career politicians have spent their time trading favors and scheming to get re-elected." No email address or other contact info is listed on the campaign's website. Bartos' campaign did not immediately respond to a Facebook message request for comment.